Thanks to the internet, we have the ability to buy anything we want twenty-four hours a day. Just grab a couple coffee, sit in your pajamas, and surf the net for the best online shopping deals. Shopping online is very convenient because we can do it at any time of day. And while it is easy to find anything anywhere in the world, using these tips for online shopping will help you get the best discounts online safely and securely no matter what you wish to buy. The most direct way to get the best online shopping discounts is to sign up to receive e-mails from your favorite stores. When a retailer has a special online promotion, it will be delivered to your inbox as soon as it happens. Some deals last for only a few hours while other stores will e-mail you the day before the big discount event. For online discount deals that last several days, the store will send you reminders in case you have forgotten to look at the sales. This online shopping tip can save you hundreds of dollars over the course of the year. Did you ever notice when you were checking out on a website that there is a box for you to add a promo code? One of the secret weapons savvy shoppers use for saving additional money on every online purchase is to use promotional codes. Almost every store has a money-saving code for its customers to use at one time or another. Some stores have several codes week, while others will only have them on rare occasions. If you are a frequent shopper to any of any business, it is imperative that you search for promotional codes before the final checkout. Sometimes these codes for free shipping or a percentage off are sent in e-mails. But if you are shopping at an online store that is not a place you typically purchase items, then getting a code will take some work. Luckily, there are many websites that make it their business to have the latest code available for internet shoppers. The following are my favorite promotional code websites. The first one is retailmenot.com. This website has promotional codes for just about any store on the web. Simply type in what you are looking for and see if it comes up. My other favorite website for finding online discount codes is mommysavesbig.com. You will find everything you are looking for at this website. Are you unsure what to buy someone? Do you know someone who has everything, needs nothing, yet you need to buy them a gift? A website that I have personally used many times over the years to find just the right gift is findgift.com. You can narrow down exactly what you want by checking off the correct boxes. A listing of gifts in your price range will appear. Once you find the perfect gift, an additional promotional code typically appears for users of the findgift.com. So if you cannot find a code online, using this site may yield you an online shopping discount. This tip for online shopping is the most important one of all. You do not want to give your private credit card information to a website that is not secure. Look for the "https:" in the address bar before typing in any credit card information. If you do not see these letters, under no circumstances should you give out your information because it is not secure. If you still wish to purchase something from this company, there should be a phone number that you can call and place your order. Make sure you get the name of the operator with whom you are speaking. If you are uneasy about buying a product from a new company, you can check with the Better Business Bureau online and see if there any problems with it. If there has been one it would be noted there. After you have securely placed an order within online company, print out your receipt. This online shopping tip is important because if you accidentally type in your e-mail address incorrectly, you will never got a receipt with confirmation that your order was placed and received. If there is a problem with the product then you need a paper trail as proof of purchase. 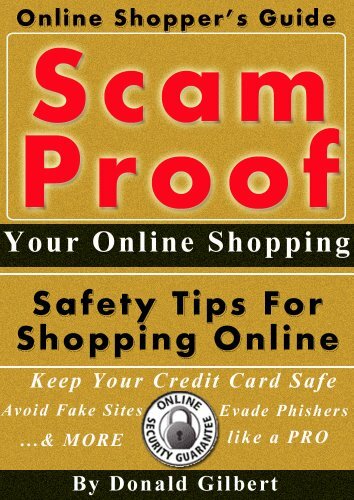 When shopping online, you want to do so safely, securely, and get the best deals around. These tips for online shopping will help you achieve all of these goals. Readers have given this book five stars across the board because of the great information included. One of the best 99 cent gifts you will ever buy! This article provides valuable information to anyone who shops online. And, as we approach the biggest shopping season of the year, I am sure it will help many to be more proactive shoppers. Thanks for sharing. I have used promotional codes. That really does help. Great tips for online shopping. I especially find it helpful to look up promotional codes. Good advice! Great, helpful article with a lot of valuable info for first-time online shoppers. Also look for sites that offer free or low-cost shipping. Some sites will really stick it to you in shipping costs (to help defer overhead for them) which add to the overall price of your items. Happy sales! The article is an informative piece and I do appreciate your contribution to Info barrel and most importantly its reader. I love the "https" tip! Excellent article. Great tips. Other popular coupon sites are retailsteal.com, couponcabin.com and couponcode.com. It is timely for pple like me-the developing world is still so prone to "bad deals" on the internet. Great. Your tip number 1 works wonders for me. I love travelling and am subscribed to every single airline possible; every 2 to 3 months they offer great discounts on flights. One can't deny the power of online shopping these days. But online shopping can be a bad experience if you are not active enough with latest tips, tricks and trends of shopping. This is a very informative article to read.